I have been dreaming about fields of lavender. or tall urns next to a front door filled with silver & purple loveliness. Don't you love to see the pictures of row after row of gorgeous lavender? It must smell absolutely amazing to be right in the middle of it all! in the back of the garden center so I always like to check while there. that didn't do so well with all the snow. 2 flatbed carts up behind us. "Here's some more for you guys." There were 26 gallon sized priced at $1.00 each. Kinda makes the Costco Lavender look overpriced lol! Last week we had a record amount of fantastic link ups at FNF! Thanks so much to everyone who joined in! So nice to meet new friends and see so many talents out in blog land! 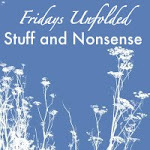 I have a link on my side bar that will take you to my FB if you would like to stop by. These are just a few links that stood out for me this week. love the checkerboard floor and gorgeous colors. look at those darling pillows~ Love them! Simply Bungalow shared a love for a little metal fence... so creative! this really makes her space and love the neat bulbs! 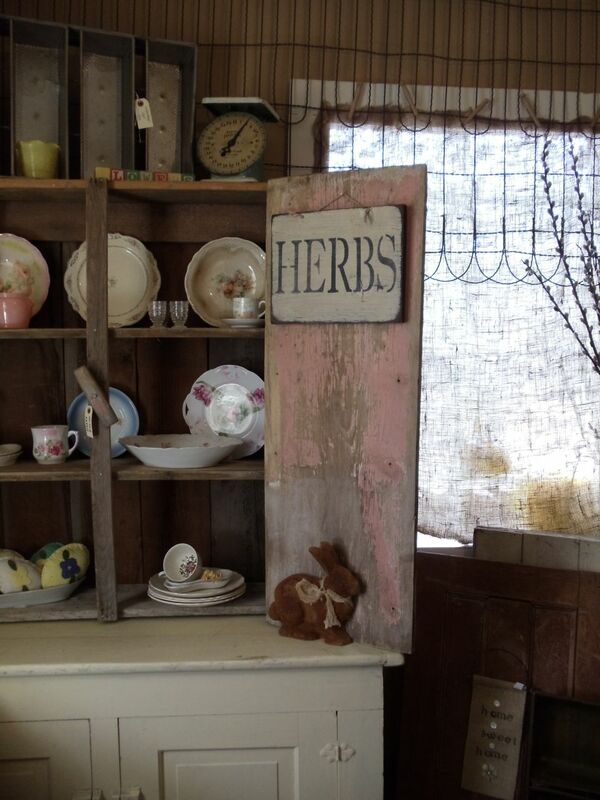 love the shabby colors and patina- so lovely! but I would love help in spreading the love! wonderful find on the lavender. thank you for hosting 'feather your nest' friday. i'm delighted to play along. love that lavendar & the way you displayed them! so so so cute! They're so pretty wrapped in the burlap! So simple, and elegant. Love it! Thank you for hosting, Courtney! I've had lavender on my mind for weeks!! WHAT A FABULOUS DEAL you found sweets! Courtney, what a deal. I wonder if they sell it here. I would love some real lavender. Just to buy a bundle of the dried stuff is so expensive. Thanks for hosting. What a great deal! I really need to check out our lowes. So pretty, I love rows and rows of lavender. oops! Forgot to add great features! That first one is absolutely gorgeous! I'm off to visit. Ohhh...your lavender wrapped in burlap just looks divine, my friend! I love how they look all lined up in front of your pretty mirror!!! Ohhh...I bet they do smell just heavenly! I can't believe that they were selling these gal. sized pots for a mere $1! Ohhh my gosh!!! I have been looking for lavender to plant in a few of my pots outside for a couple of years now...with no luck! Maybe it doesn't do well in Colorado...not sure! But I'm with you...I see photos of lavender fields and they just take my breath away! Well sweet friend, thank you so much for sharing your beautiful lavender with us today and thank you so much for hosting another fabulous party! Hello lovely lavender lady! :-) I'm all linked up...thanks for hosting us! Hi Courtney! I can smell the lavender! Love that stuff. I'm joining your party today and thank you for hosting. Oh Courtney, I need to find some lavender plants! They look wonderful, thanks for linking up with VIF! You are so right - lots of inspiration and creativity here. "Lucky, Lucky You"! I LOVE Lavender! and we can NEVER EVER have too much of it! Hi Courtney, The Lavender looks beautiful on your sideboard. I adore lavender but you don't see much of it in Virginia. Thanks for hosting. WOW that is a deal indeed..love this whole post!! I like the way you've bundled up your lavender, Courtney! So sweet! Great deal you got! Looks awesome with the burlap! I need more lavender myself! I hope it was $1.00 at Home Depot because that's where I'm headed! 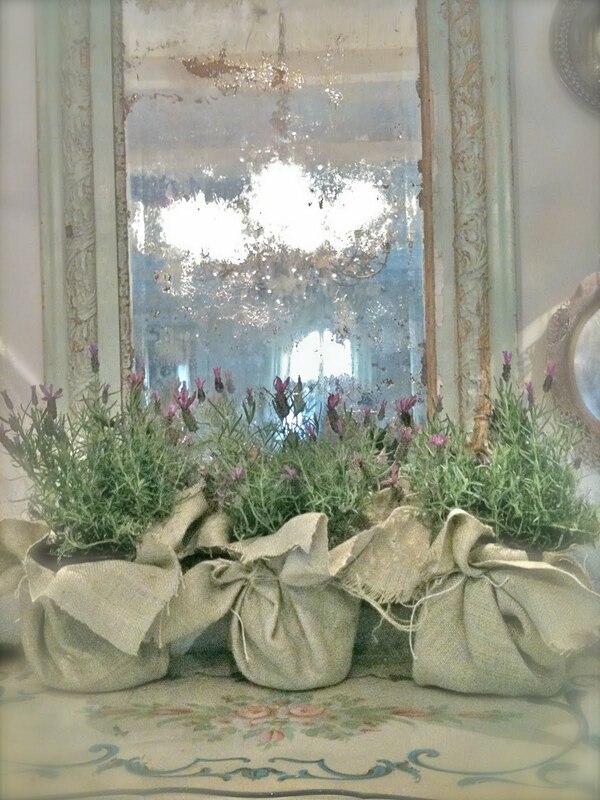 Love the idea of wrapping the lavender in the burlap. I may go look for some lavender for myself. I could easily add more to the garden. We planted lavender for the first time this year in our garden. I can't wait for it to come up! I love lavender! Your is gorgeous! I bet I won't find it here for $1. What a great deal! Thanks for hosting! Any variety of lavender draws me in like bees to honey as well! Have some sweetly scented in a fairy garden right outside the French doors. I just love lavender and you really got a great deal. I am so happy I could join your party this week. Have a wonderful weekend. Who doesn't love lavender! I bet I won't find it here either for $1. I like the way you displayed them. Thank you for the party! Loving your lavender...it is one of my favourites! I am joining your party for my first time and yes I have been a follower for some time now! I adore lavender ~ both its look and its sweet aroma! How prettily yours is all wrapped up! Thanks so much for hostessing this wonderful Friday event. I've just linked up and also become your newest follower! Would love it if you would also follow me! What an incredible find! Awesome luck! I love how they look in their burlap!! What a great deal, love them in burlap, beautiful photos. And such lovely feature posts! Thanks for hosting this inspiring party. Beautiful post! I can't imagine finding anything for $1 a pot. We're just starting our season here, maybe later???? I can only hope. love the features...especially the corbel book ends...have a wonderful weekend! Lovely!! Thanks for honoring lavender. That chandelier is indeed gorgeous! Have a lovely weekend and thank you for hosting! I adore lavender. I like the way you have it in the burlap tied with string. Too, too cute! I am up to my eyeballs this week, so I won't be participating in the linky party, but I appreciate your hosting it every week for us! I love, love lavender, I was very excited to see that the lavender I planted in my garden last year survived our cruel winter, I will have lots of lavender this summer. Thank you for hosting another Feathered Nest Friday. I need to get me some lavender! Hey sweet girl! 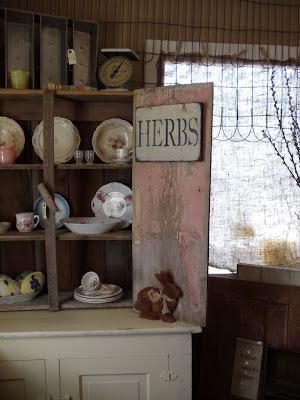 So sorry I missed last Friday...so Ive linked up 2 things today:) I LOVE the Lavander...Im OBSESSED with Lavander! Love your burlap wrapped lavender! CUTE I did the same thing with my Rosemary pot!!! oh, soooo lucky!!! I always check, but nothing that good!!!! YEEhaw! what a great score... I am mad for lavender... esp Provence or Grosso, they have the best scent ever....yay for you! I love the smell of lavender. I have some in our garden. Do you know how to dry it? Just hang it upside down? I love lavender, so french and pretty! I grow it every year. I linked up. Courtney, thank you for featuring my chandelier! 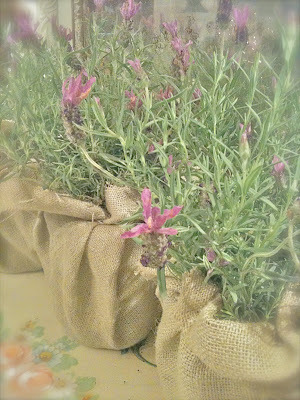 Your little lavender plants look lovely wrapped in rustic burlap and string! Omg, what a deal! You really lucked out on that. They look like they are in great shape too. I'm number 200! I hope you get this far!! Just look at all your Friday fans!!! Love the lavender! I wish I could put a plant/flower arrangement like that in our home.. unfortunately my 3 cats (the tag-team of destruction) have other ideas. =/ Thanks for sharing another great round of photos! This week my favorites are the Romeo&Juliet pillows- too cute! They remind me of some French linen pillows I saw on Belle Maison Francaise earlier this week. Lovely! Love all the cute Easter ideas too!! Courtney, thank you for Facebooking me (is that a word?) :) very very sweet of you and I hope you are having a fabulous weekend. I need to find some lavender! Thanks so much for hosting such a fun party. I enjoy it every week! Lucky you getting lavender for $1.00 a pot! Much better than Lowe's $9.98, but I love lavender so much I went ahead and paid that much anyway. Thank you for sharing, I love the breakfast room and the chadalier. I so love lavender, in my neck of the woods they're very cheap, like all flowers actually! I was to late to join your lovely party a couple of hors ago, but I will next time...do visit me anyway. Thank you.